"Meiji-maru Photo Contest is being held now (from November 1 to April 15)!" We have started a Twitter account. Meiji-maru, an iron ship (nowadays all ships are built with steel) ordered by the Meiji Government from the Napier Shipyard in Glasgow, the UK, as a lighthouse tender, completed in 1874 and navigated to Yokohama in the following year. The ship, referred to as comparable to a first-class "hikyakubune" (a ship used for emergent matters at the time), was a luxurious state-of-the-art ship with special rooms and salons, and served as not only a lighthouse tender but also a royal ship. Emperor Meiji and many other senior officials boarded her and she played critical roles in modern Japanese history. Among such roles, in the territorial dispute over the Ogasawara Islands with the UK in 1875, the investigating group from the Japanese Government sailed with the Meiji-maru and arrived at Ogasawara Islands earlier than the British ship. This helped the Ogasawara Islands to be claimed as the territory of Japan. Further, the later incorporation of Okinotori Island and Minami-Tori Island enabled Japan to secure an EEZ (exclusive economic zone) of 4,470,000km2 in addition to territorial waters, which is the 6th largest EEZ in the world. About 1,500,000km2 of this area, one-third of the EEZ, belongs to Ogasawara Village in Tokyo Prefecture. Also, in 1876 when Emperor Meiji visited the Tohoku area and Hokkaido, he boarded in Aomori, called in at Hakodate and arrived at Yokohama safely on July 20. To commemorate the date, "Marine Memorial Day" was established in 1941 and it became "Marine Day" in 1996. The Meiji-maru continued to serve as a lighthouse tender for about 20 years before being transferred to the Tokyo Nautical School (our former entity). From then, she, as a moored training ship, fostered more than 5,000 young mariners for about 50 years until 1945. During the Great Kanto Earthquake in 1923 and the Great Tokyo Air Raids in 1945, she provided accommodation for injured people and supported relief activities. In 1978, she was designated as a national important cultural property as the only iron ship in Japan and a valuable heritage, highlighting the shipbuilding skills of the iron ship era today. 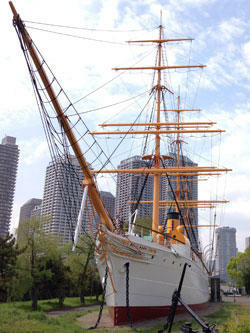 The Meiji-maru was the first ship designated as a national important cultural property. Because of deterioration due to aging, large-scale restoration work was done to the Meiji-maru by the Ministry of Education, Culture, Sports, Science and Technology and our university. The work started in March 2015 and she regained her original beauty. * Currently we are closed due to the winter season. However, we accept reservations of groups of 10 or more people. Please feel free to contact us.